Photo of Little League Field after sign was erected over the concession stand. The Little League Field was re-dedicated July 26, 2006. The sign was donated by Melley Memorial FOP Lodge #65. Nearly 50 miles and two counties removed from Summit Hill, members of the Melley Memorial Lodge No. 65, Fraternal Order of Police, know all about the late Philip C. Melley, a former Pennsylvania State Police trooper from Summit Hill who was killed in the line of duty 49 years ago in Berks County. That's because not only is the FOP lodge named after the late state policeman, but because the lodge just this week participated in a rededication ceremony of Summit Hill's quaint Little League Baseball field that bears Melley's name. In a solemn ceremony, current and retired state policemen, as well as league officials, vowed to make certain everyone in the tiny Carbon County community knows about Melley's tragic death, and that they won't forget him in the future. Intrigued that their lodge is named after the late trooper, Leonard Nebistinsky, the lodge's sergeant-at-arms, chaired a committee whose mission was to perpetuate the late Summit Hill policemen's name. Ironically, Nebistinsky visited Summit Hill in 1957 as a nine-year-old boy whose ambition was to become a state policeman. "I wanted to be a trooper, and so my mom brought me to Summit Hill in 1957 when Philip Melley was killed and buried here. I still remember the horse-drawn carriage (that carried Melley's body to its final resting place at St. Joseph Cemetery in White Bear)," he said. That memory still being vivid in Nebistinsky's mind, it created flashbacks just two months ago when he and three other officers of Lodge No. 65 visited Summit Hill to pay respects to Melley at his gravesite. "We went to his grave, and then drove around Summit Hill," he recalled. "We came upon this Little League field and the only thing we found was a small granite stone that had Melley's name." Insisting that Melley being killed in the line of duty, and his subsequent funeral that followed, "inspired me even more to want to be a state policeman," Nebistinsky took the charge of his FOP brothers to head a committee that would make sure the story of Melley and his untimely death no longer goes unknown in Summit Hill and nearby vicinities. Retired as a corporal in charge of the criminal investigations unit at the Schuylkill Haven barracks after 25 years of service, Nebistinsky remains proud and committed to that profession. "We weren't happy with that (the granite marker)," he said. And so, noticing billboards from town and Panther Valley sponsors adorning the field's outfield fences, the lodge members opted to create one to perpetuate Melley's name. "Nowhere did a sign say anything about Trooper Melley, we thought," Nebistinsky said. "We decided the field needed more than this." At the lodge's annual picnic that followed, members discussed Melley and the field. Almost everyone dug into their pockets and make monetary contributions to a fund aimed at giving Summit Hill's field a fitting banner that carried Melley's name. Nebistinsky, the lodge's historian, had a picture of Melley blown up to huge proportions. Likewise, a logo of Lodge No. 65 was prepared. A Schuylkill Haven signmaker was commissioned to prepare a billboard to be donated to Summit Hill. Made of vinyl, the sign, Nebistinsky said, will surely last a few decades. About his trip to Summit Hill this week, where the lodge presented the billboard and a $500 contribution in Melley's name, Nebistinsky said, "It makes me feel good. Melley's death, like I said, was part of the inspiration of my career. To see that sign, it broke my heart. But, now, anyone who comes here will see that sign and they will know about Philip Melley." According to Dave Gecelosky, president of the lodge, one of his goals if to "honor Trooper Melley in everything we do." He commented, "The rededication of the ballfield did just that and hopefully a few more people know who Phil Melley was. I feel very honored to to be part of this lodge and the FOP in general." He pointed out the lodge was renamed after Melley in 1960, and was formerly named the Pagoda Lodge. "Our brothers then voted to memorialize him and we continue to do that as well, each and every day. From what I have read about him, Melley was a kind hearted soul and was quick to help anyone he encountered. We as a lodge officers try serve our membership much in the same way." Gecelosky said when the lodge officers visited Summit Hill in May and saw Melley's name at the field, "a feeling of tranquility and calmness came about us." 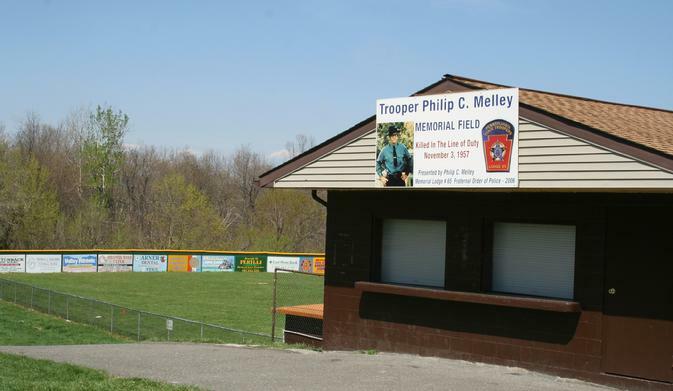 He furthered, "We decided then and there that we must further honor our lodge's namesake so that ball players, parents and spectators visiting there know who Phil Melley was." About his visit to Summit Hill this week, he added, "I feel like a part of a large family. Everyone is very kind and supportive and we feel very welcome to the town. It gives me insight of who Phil Melley was as this was his hometown and we can see how the people of the town conduct their daily lives. It is apparent we have a common thread of being commited to the promoting of the SHLL in honor of Trooper Melley." Meanwhile, Richard Freed, the lodge's secretary, confessed Melley's name didn't have much meaning to him, until he heard the story of the trooper's death. "When Lenny (Nebistinsky) resurrected the story, I thought this will be a good thing for all of the younger people on the job (as troopers)...to know about the sacrifice. It will connect all the guys," he said. In addition to the FOP members, four troopers from the Lehighton barracks of the PSP attended the rededication. One of them was Joseph Sommers, Summit Hill native who was 11 at the time Melley was killed. Sommers, who is now in his 38th year with the state police, recalled, "I watched the funeral procession... it was indeed a sad time." The action by Lodge No. 65, Sommers said, "was long overdue." He commented, "I think it's great that the FOP and state police stepped forward to honor him (Melley). It's a well-deserved honor." According to Jay Horvath, president of the Summit Hill Little League, the sign will be deadbolted high atop the concession stand at the field, where it will greet everyone who arrives at the field. "This is kind of a shock," Horvath said of the solemn moment. "It's great to see an organization outside of town to come in and give that kind of money to a Little League organization." Horvath too admitted he "knew nothing about Philip Melley," but, he related, "Jeff (Szczecina, a current state policeman who played a role in the program) told me all about Melley and how he died in the line of duty. Everyone in the league is committed to preserving Philip Melley's name. I told the FOP members we will look into doing more to perpetuate his name with the $500 contribution they gave us." Also present for the ceremony was 84-year-old Joseph "Chubby" Carnish, the league's first president. He recalled the field was in the process of being built in 1960 and was named in memory of Melley the following year. "It was a unanimous vote," recollected Carnish, who operated the league for an unbelievable 31 years and whose brass headshot hangs at the field. "All of us were saddened by the way Philip died," Carnish added. "Everyone in the league was in favor of memoralizing him. Now, almost 50 years later, to see the field rededicated in his memory, I really appreciate it. This is really a great great thing."